If you would like to be included in the slideshow, please send me an image of yourself somewhere in the world. ../pics/Mckee.jpg##Professor McKee at the Cairo, Egypt zoo ../pics/Blois.jpg##Professor Blois at the Taj Mahal in India, July 2008 ../pics/Esposito.jpg##Professor Esposito on the Great Wall of China, January 2004 ../pics/Montaner.jpg##Professor Montaner at Cinque Terre on the Italian Riviera a few years ago ../pics/Donnelly.jpg##Catie D. (HIS 241) on the Canadian side of Niagara Falls during the summer of 2008 ../pics/Christensen.jpg##David C. (HIS 101) at the Colosseum in Rome in 2008 ../pics/Porter.jpg##Professor Porter and wife in Uchisar, Cappadocia, Turkey about 2005 ../pics/Lynn.jpg##Chomar L. (HIS 101) at the Bagan Capital Gate in Bagan, Burma in 1999 ../pics/Evans.jpg##Professor Evans in Strasbourg, France about 1990 ../pics/Mikkola.jpg##Sanna M. (HIS 101) in Vejer de la Frontera, Andalusia, Spain about February 2004 ../pics/Allison.jpg##Melinda A. (HIS 101) in the castle gardens on the hillside of Prague Castle, Prague, Czech Republic during the summer of 2007 ../pics/Hefner.jpg##Caroline H. (HIS 101) in Old Town Paraty near Rio de Janeiro, Brazil on 3 April 2009 ../pics/Phan.jpg##Giang P. (HIS 111) with cousins in his grandmother's village of Bien Hoa, Vietnam on a recent trip ../pics/Beattie.jpg##Annia B. (HIS 101) in downtown Lima, Peru during the summer of 2009 ../pics/Bailey.jpg##Kristen B. (HIS 111) at Ashford Castle in Ireland in May 2009 ../pics/Bunnell.jpg##Roxanne B. (HIS 101) in Haines, Alaska (the Valley of the Eagles) in March 2009 ../pics/Miller.jpg##Stephanie M. (HIS 102) in Montepulciano, Italy recently ../pics/Bourn.jpg##Luciana B. (HIS 101) at the Elevador Lacerda in Salvador, Brazil recently ../pics/Howard.jpg##Professor Howard in the Roman forum way back in 2004 ../pics/Vichailakana.jpg##Preawpan V. (HIS 102) in the Bahamas in 2009 ../pics/Martin.jpg##Meg M. (HIS 135) in the Jamaican rain forest in August 2007 ../pics/Hurry.jpg##Herrishia H. (HIS 135) at Port Lucaya in the Bahamas in 2009 ../pics/Rushing.jpg##In a recent photo, SGT Rheonna R. (HIS 101) stands on one of Saddam Husein's former palaces in Baghdad ../pics/Donato.jpg##Joshua D. (HIS 112) standing on Kale Hill over Amasya, Turkey, April 2009 ../pics/Harrison.jpg##Barbara H. (HIS 101) standing by a canal in Venice sometime in 2007 ../pics/Astete.jpg##Rachel A. (HIS 101) in Peru circa 2006 ../pics/Kim.jpg##Christina K. (HIS 101) by the Thames River in London about October 2007 ../pics/Brill.jpg##Becky P. (HIS 111) in Tijuana, Mexico in 2004 ../pics/Mcclanahan.jpg##Louisa M. (HIS 111) with her daughters in St. Peter's Square, Rome in June 2007 ../pics/Dillow.jpg##Layla D. (HIS 102) by the Cliffs of Moher, Ireland in September 2009 ../pics/Ruckman.jpg##Eric R. (HIS 101) at the end of the Inca Trail near Machu Picchu, Peru ../pics/Kincheloe.jpg##Professor Kincheloe crossing the glaciers of Cordillera Blanca in the Peruvian Andes in 2005 ../pics/SonyaV.jpg##Sonya V. (HIS 102) in Delhi, India in July 2009 ../pics/KPhucas.jpg##Kaitlin P. (HIS 102) in front of the doors of the Duomo in Milan, Italy in 2009 ../pics/MikeFried.jpg##Mike F. (HIS 102) at the Guachimontones archeological site, Teuchitlan, Jalisco, Mexico in November 2009 ../pics/DBruk.jpg##Daniela B. (HIS 101) in Rio de Janeiro, Brasil in 2009 ../pics/Aus.jpg##Jamie A. (HIS 102) near the Parthenon (undergoing massive preservation) in Athen, Greece in 2007 ../pics/Cavey.jpg##Professor Cavey, once a student in Canada, in a recent photo ../pics/BrentT.jpg##Brent T. (HIS 101) in Pompeii, Italy, in the spring of 2010 ../pics/DanT.jpg##Dan T. (HIS 102) on the roof of the Patmos Castle and the Monastery of Saint John the Theologian on the Greek island of Patmos ../pics/JessicaS.jpg##Jessica S. (HIS 101) at the Berlin Wall in July 2009 ../pics/MichelleH.jpg##Michelle H. (HIS 101) at the Colosseum in Rome, September 2009 ../pics/Tanzer.jpg##Tanzer H. (HIS 102) by a canal in Venice, Italy ../pics/Devenish.jpg##Helen M. (HIS 101) with family in front of the Devenish Round Tower, Enniskillen, County Fermanagh, Northern Ireland ../pics/Justin.jpg##Justin T. (HIS 101) with his fiance at the Puente de las Americas (the Bridge of the Americas) across the Panama Canal in 2009 ../pics/Isabelle.jpg##Isabelle B. (HIS 101) with friends by the Eifel Tower in Paris recently ../pics/Teegan.jpg##Heather T. (HIS 102) in the Bahamas in 2010 ../pics/Chelsea.jpg##Chelsea S. (HIS 102) with mom in Paris in January 2009 ../pics/KD.jpg##Karo D. (HIS 101) among the ruins of Carthage in Tunisia in 2001 ../pics/Quang.jpg##Quang T. (HIS 102) in front of the Chitchen Itza pyramid, Mexico recently ../pics/Autumn.jpg##Autumn E. (HIS 101), with sisters, on the beach in the Bahamas ../pics/TimU.jpg##Tim U. (HIS 111), with friend, in front of the Brandenburger Tor, Berlin, in 2008 ../pics/Shiva.jpg##Shiva H. (HIS 101), at Cerro de Perquin in El, Salvador in 2008 ../pics/Anklam.jpg##Sean A. (HIS 102), with pigeon, at the Fort Saint Elmo in Malta ../pics/Vanessa.jpg##Vanessa M. (HIS 101) at Machu Picchu, Peru ../pics/SarahM.jpg##Sarah M. (HIS 102) with the "sultan" in Istanbul, Turkey ../pics/Rodin.jpg##Diana S. (HIS 111) in front of Rodin's statue, Le Penseur (The Thinker), in Paris ../pics/Maria.jpg##Maria B. (HIS 101) at the Rheinfall in Schaffhausen, Switzerland ../pics/Romeo.jpg##Professor Romeo standing astride the the Eurasian and North American tectonic plates in Iceland ../pics/Angel.jpg##Angel E. (HIS 102) at the Castillo San Felipe del Morro in Puerto Riico in August 2010 ../pics/Campbell.jpg##Professor Campbell at the Palais de Versailles way back in the 1990s ../pics/Bland.jpg##Gloria B. (HIS 101) at the Thika School for Girls, Kenya in 2007 ../pics/AlexaW.jpg##Alexa W. (HIS 101), and Aubri, jet-skiing at Nassau in the Bahamas in 2009 ../pics/Daniela.jpg##Daniela N. (HIS 102) sitting on top of the pyramids near Mexico City in 2009 ../pics/JK.jpg##Jessica K. (HIS 101) and Chris at the Temple of Debod in Madrid in November 2010 ../pics/RG.jpg##Ruben G. (HIS 101) in the old town part of Dresden, Germany ../pics/Sinai.jpg##Peter S. (HIS 101) in the Sinai Mountians of Egypt in 2011 ../pics/Campion.jpg##Professor Campion in the Hall of Mirrors at the Palais de Versailles (France!) ../pics/Cohinta.jpg##Cohinta G. (HIS 102) at the Maya ruins in Tulum, Mexico recently. ../pics/Andreia.jpg##Andreia H. (HIS 101) and fiancé in Stockholm, Sweden in winter (2010). ../pics/Anya.jpg##Anya D. (HIS 101) on the Westminster Bridge in London in the summer of 2011. ../pics/McDowell.jpg##Marie M. (HIS 101) and daughter in the Julian Alps in Slovenia in the summer of 2011. ../pics/BeckyL.jpg##Professor Linford at the Jon Stewart Late Show recently. ../pics/Shane.jpg##Shane E. (HIS 101) in Egypt at the Great Pyramid complex. ../pics/JoeC.jpg##Joe C. (HIS 111) at an abandoned ancient Christian monastery in Iraq. ../pics/Leah.jpg##Leah C. (HIS 101) at the Leaning Tower of Pisa in fall 2011. ../pics/Susanna2.jpg##Susanna S. (HIS 135) at the Tour Eiffel in 2011. This is the HIS 101 course website. On this page, you will find important information about the course and the links to the course assignment schedules (see below). Joshua Cole, Carol Symes, Judith Coffin and Robert Stacey, Western Civilizations, Brief 3rd edition combined volume (W.W. Norton, 2012, isbn 9780393934878). It is also ok if you use the Second Brief Edition combined volume (W. W. Norton, 2009, isbn 9780393932652) . Please note that you can use this same textbook for HIS 102. If you are wondering whether you must buy the textbook, then please watch this short video. Please check the distance learning bookstore website for information on where and how you can purchase your textbooks. You may also be able to buy your books at another retail outlet or on the web. HIS 101 reviews the general history of the West from about 3000 bce to 1600 ce and allows students to reach a basic understanding of the characteristic features of the West's historical development. The course also helps students to develop an understanding of the academic discipline of history and supports the general educational goals of historians and the college. Grading in the course is based on written assignments and on class work that demonstrates critical thinking. Define and describe the importance of key individuals and events in Western history. Understand the general chronology and geography of Western history. Understand the main forces at work in the historical development of the West. Develop an ability to analyze historical sources and reach conclusions based on that analysis. Compose critical essays that explain the importance of certain historical events in the West. Understand the role and work of the historian. 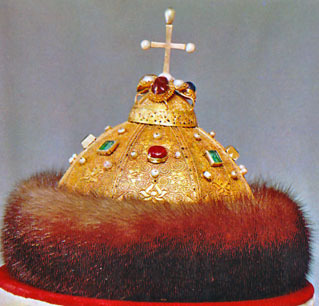 The Cap of Monomakh (Шапка Мономаха in Russian) was one of the traditional symbols of the medieval Russian monarchy. There is no agreed-upon certainty about the cap's origin, although it probably dates to the fourteenth century, or how the cap became one of the important symbols of the Russian autocracy, but all kingships/monarchies had their specific symbols, which always included a crown of some sort. The Russians were no exception to that. According to Russian legend, the Byzantine emperor sent this crown to Vladimir Monomakh, Grand Prince of Kiev, sometime in the early twelfth century, and it was used during the coronation ceremonies of the Russian tsars in the sixteenth century--a small gap in time. Peter the Great replaced the "cap" with a more formal, imperial crown in the early eighteenth century.